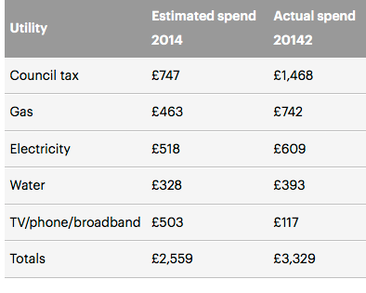 Having written about smart meters and in so doing rediscovering the spend we make on energy, I was struck by the steady rise in our expenditure on communications, which is a similar figure to the spend on energy. Here I have a look at the information on our general spend on that. I have looked at the accounts for the last four years and three different houses and, not including hardware, we have spent £5015, which makes the average annual spend to the nearest £5 very much the same as the energy costs of the Wallsend period. So it would appear that the spend on communication is a similar number to that spent on energy. 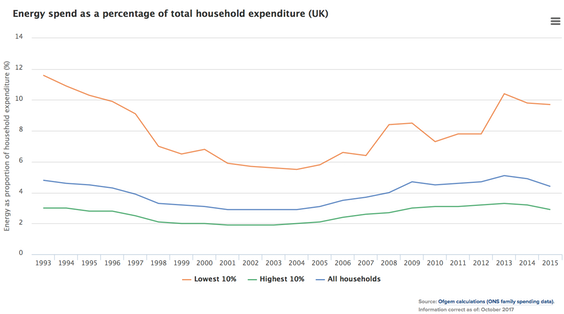 The coloured graph is from Ofcom  and shows a typical monthly spend per household on the top of each column, suggesting £1250 to £1500 per year for the period – and these figures are not including capital expenditures (e.g. movies, phones, hardware), nor repairs and maintenance such as upgrades/renewals to software. With surprisingly little difficulty I found a similar graph from OfGem, showing that typical energy expenditure (the middle line) was 4.4% in 2015 (lower than comms) but 5.1% in 2013 (higher). You can see the trends in the two graphs, though essay 243 discovered a likely jump in gas price, and therefore total energy costs, expected in 2018. It looks to me as though calling these two expenditures as similar expenditure per household is a reasonable statement. Note that the lower graph, from OfGem, shows the increased energy costs to low income households. I found an equivalent graph to the top one for the US, showing greater growth at around 10% per annum from 2006 and 5.5% every year in the previous decade; there are no guarantees these are measuring the same thing, of course. This smaller bar graph is from the Scottish Friendly Society, found on the Money Advice website . Note that these figures put telecomms at adding up to £104.82 compared to £90.10 for energy and water, so more than 15% higher, assuming everyone has all three. The linked site points to things you might do to reduce these bills. Santander did a similar study (the grey table) which disagrees markedly. The reaction suggests that £117 (for comms) should be £1170. Their report—the one I found—uses the term household bills to include Council Tax, TV, phone, broadband, gas, water and electricity. Rent and mortgage payments were excluded from the analysis. Back in Wallsend, for which I have complete figures because I ‘did’ the accounts for the period, we used annually just under 3700kWh of electricity and between 8500 and 11500 kWh of gas. The electricity dropped off quickly when the PV solar installation kicked in, so that the next year looked as though we would use under 1300kWh from the grid; call that a third of the previous figure. See essay 218. The end figures also dropped as occupancy fell. Annual energy cost about £1250, dropping rapidly to £800. Meanwhile communications costs ran at £1125 before we include repairs or replacements, so a very similar number. 2014 £1950, 2015 £1360, 2016 £670 (or £3400 with the IT purchases), 2017 £1030, which suggests an average running cost for tv, phones and computers of £1250, not including the latest hardware purchase. https://www.ofcom.org.uk/__data/assets/pdf_file/0028/98605/Pricing-report-2017.pdf well worth a proper read. Tip: if you are worried about internet security, have a look at setting your DNS at 9.9.9.9. Look for Quad9 on the ‘net. Site. Free.